Amazon Fire TV, developed and released by AMAZON in April 12, 2014. it’s a powerful streaming media device which helps to enable app and game developers to reach more customers in the living room. The new Amazon Fire TV is mainly available to customers in US, UK, Germany, and Japan. 5x the processing power of the latest generation Roku. 8x the processing power of Chromecast. 8 GB of on-device memory. Add up to 128 GB of additional storage via microSD card slot. Dedicated GPU and Dolby Digital Plus surround sound. The new Amazon Fire TV is 75% more powerful with Wi-Fi. Support Alexa and 4K Ultra HD. Contains some feature like Parental control, Mirroring . There are two ways to build the application. HTML5 (HTML5 web apps, Cordova apps). 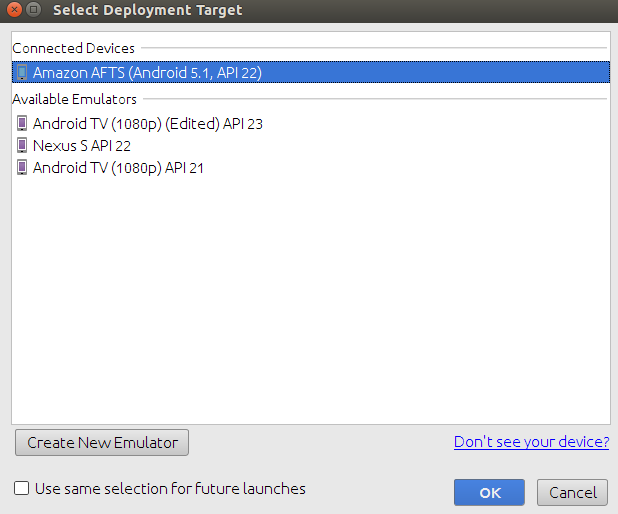 To start developing apps for the Amazon Fire TV platform, you need to first set up your development environment. You must have the Java SE Development Kit 8 or later on your computer so Install the Java Development Kit (JDK). Install Android Studio and Set Up Android Studio . 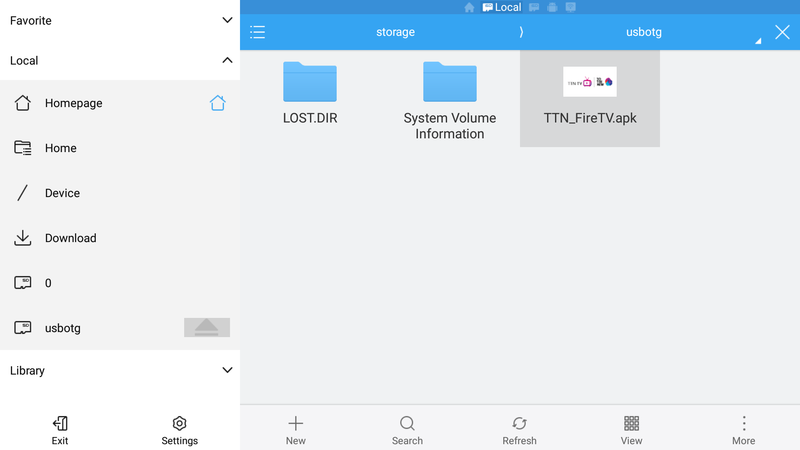 Connecting Fire TV Through Android Debug Bridge (ADB). Android Debug Bridge (ADB) is a command-line utility for running and managing Android apps on your device or emulator. ADB is available when you install Android Studio but for Windows users need to install a special USB driver to set up the ABD. Add the path to your .bash_profile with the following command, replacing /Users/<your username>/Library/Android/sdk/platform-tools/ with your path to platform-tools. 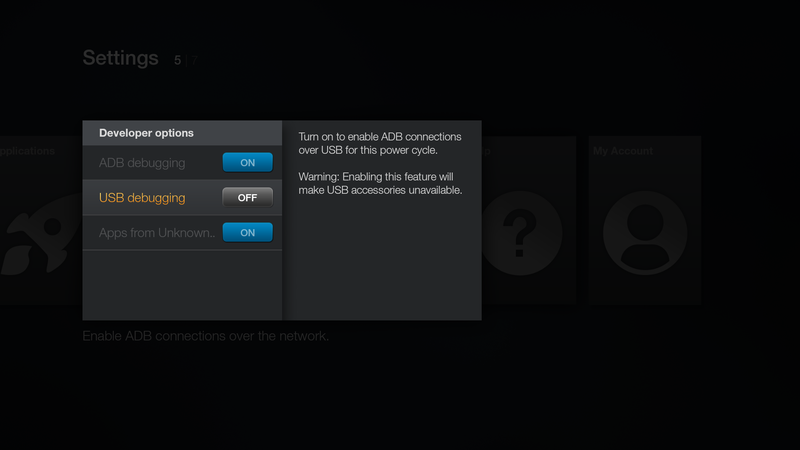 You must enable both ADB and debugging on the Fire TV device before you can connect to it. From the Fire TV home screen, select Settings. Go to System > About > Network. Make note of the IP address listed on this screen. Make sure your Fire TV device and your computer are on the same network. You can use either a wifi network or a wired network. 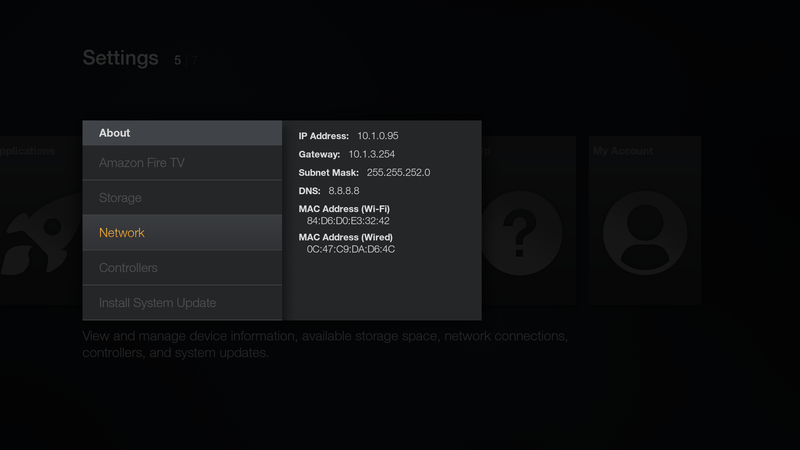 NOTE- <ipaddress> is the IP address of Fire TV device noted in the 2nd step. 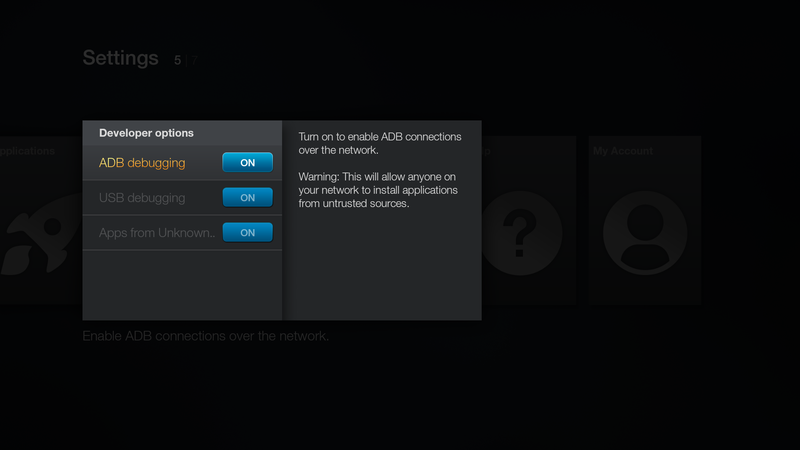 When you run adb connect command you are able to see you fire device in your Andorid Studio you can select the device and install the application to your fire tv directly. You can also install the application using Usb. From Fire TV’s main screen, select Settings > System. Install any File explore application and access the location of your application on Usb and click to install. Go to the Apps section in your fire tv and select the app to run in Fire tv. From Fire TV’s main screen, select Settings > Applications. Select Managed Installed Application > Select your app. 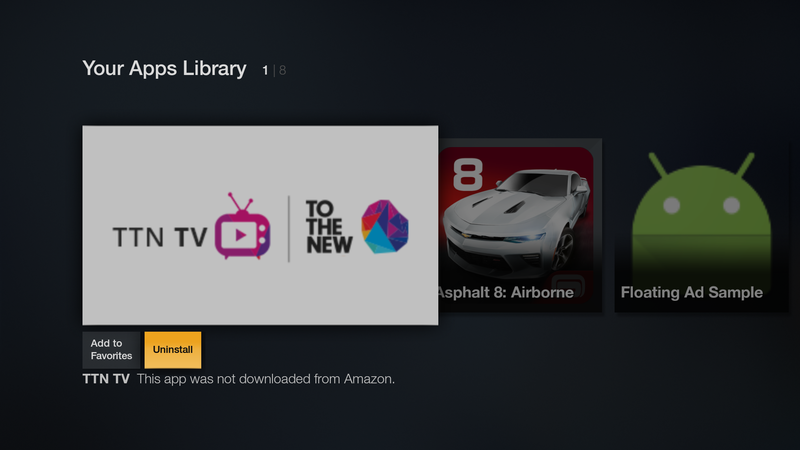 From Fire TV’s main screen, select Apps > Go to Your App Library. Select your app > Select Uninstall > Uninstall.